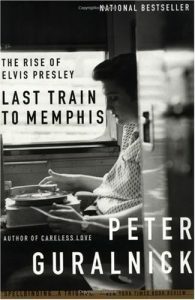 Train to Memphis was hailed on publication as the definitive biography of Elvis Presley. Peter Guralnick’s acclaimed book is the first to set aside the myths and focus on Elvis’ humanity, as it traces Elvis’ early years, from humble beginnings to unprecedented success. At the heart of the story is Elvis himself, a poor boy of great ambition and fiery musical passions, who connected with his audience and the age in a way that has yet to be duplicated.